One of the famous Russian-American professional dancer, specializing in Latin dancing is known for Artem Vladimirovich Chigvintsev. He performed both on Broadway and more recently in the West End in 2009 and began his career by joining Strictly Come Dancing straight from Burn the Floor in London in 2010-2013 in his first year, winning the show along with his celebrity partner Kara Tointon. He appeared in the music video for Hush Hush; Hush Hush by The Pussycat Dolls, dancing with Nicole Scherzinger in 2009 and he has also appeared in an episode of the TV show The O.C. and in the movie I Now Pronounce You Chuck and Larry. Artem Chigvintsev was born on 12th June 1982, in Izhevsk, Udmurt Republic, RSFSR, the Soviet Union with the full name of Artem Vladimirovich Chigvintsev. He was born and raised in Russia, but currently, he resides in Palo Alto, California. His nationality is Russian. He was not much serious in his education because of his dedication to dancing. His ethnicity is White. His religion is Christian and his horoscope sign is Gemini. There is no information regarding his parents, siblings but it will be updated soon. At present, his age is 36 but his age will turn to 37 upon his upcoming birthday in June 12 as of 2019. 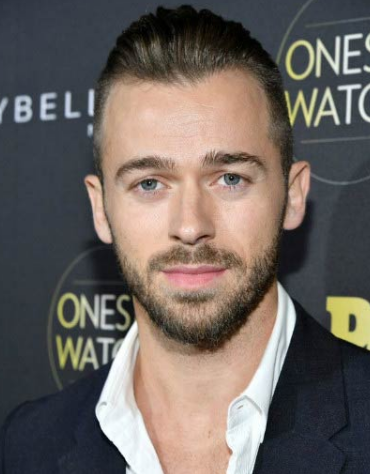 Artem Chigvintsev is a very handsome dancer with a tall height of 5.7 ft and balanced weight of 75 kgs (165 pounds). He has grey colored eyes and light brown hair. Being a dancer he has maintained good body physique. He has got a very charming smile in a glowing face attracting a lot of people towards him. His other body measurement will be updated soon. Artem is very much dedicated towards dancing career since his childhood. So, due to this, he took dance classes from a young age. Winning numerous dance competitions in Russia he moved away at 15 to gain more training in Germany, Italy, and England. He moved towards the United States in the year 2003 and started as a dancer. He then began dancing with champion ballroom dancer Giselle Peacock. He also auditioned to appear as a contestant on the first series of So You Think You Can Dance but later he was eliminated alongside his fellow contestant Melissa Vella and returned as a guest choreographer for season two. He joined Strictly Come Dancing series 8 as a professional dancer, where he was partnered with actress Kara Tointon in September 2010. The pair achieved good scores in the first five weeks of 30, 32, 31, 32, and 37. In week 5, they were awarded the first 10 of the series by Alesha Dixon for their pasodoble. He and Tointon made it to the final along with Matt Baker and Pamela Stephenson. The pair also went on to win the competition, defeating Matt Baker and his partner Aliona Vilani, and being crowned series champions for 2010. He is one of four professionals to win the series as a first-time Strictly pro. He was partnered with Holly Valance in 2011's Strictly Come Dancing season 9. He and Valance made it to Week 11, the Semi-Finals, before being eliminated. His celebrity partner in the 10th series of Strictly Comes Dancing was television presenter Fern Britton and they were eliminated in Week 6. His celebrity partner in the eleventh series of Strictly Come Dancing was former Coronation Street star Natalie Gumede, who played Kirsty Soames. They reached the finals and became one of the runners-up, along with Susanna Reid and Kevin Clifton, losing to model Abbey Clancy. After that, he appeared in the 18th season of Dancing with the Stars in 2014. He was paired, for season 19, with actress Lea Thompson and later they eliminated in week 9 (the quarterfinals) and finished in sixth place. He returned for season 20 and paired with award-winning singer Patti LaBelle and eliminated on week 6 and finished in 8th place. He was announced as one of the professional dancers for season 21 of Dancing with the Stars on 19th August 2015. He wrote on his Instagram account that he would not be competing on season 21 due to a last minute casting change, but he would still dance with the pros in the ballroom. He returned for season 22 partnering with actress Mischa Barton and they eliminated on Week 3 of competition and finished in 11th place. He was paired with Brady Bunch actress and author Maureen McCormick and they eliminated in week 7 finishing in 8th place for season 23. He paired with former figure skater Nancy Kerrigan for season 24 and they got eliminated in a double elimination along with The Bachelor star Nick Viall and Peta Murgatroyd. He was paired with WWE wrestler Nikki Bella for season 25 and got eliminated in week 7 of the competition in a double elimination only announced at the end of the show. He was partnered with Olympic snowboarder Jamie Anderson for season 26 and they got eliminated in the first week of competition, tying in 9th place with Johnny Damon and Emma Slater. He was paired with Paralympic skier Danelle Umstead for season 27 and they eliminated on week 2 and finished in 12th place. He was a choreographer on So You Think You Can Dance in 2011. He has also appeared in an episode of the TV show The O.C. and in the movie, I Now Pronounce You Chuck and Larry. He acted the part of lead choreographer in the CBeebies Christmas Pantomime, Cinderella in 2011. The net worth of Artem is estimated to have $2 Million as of 2019. His exact salary has not been revealed yet but there is no doubt in the mind of his follower that he is earning a considerable amount of salary from his present work. Artem is a married person. He was married to ballroom dancer Giselle Peacock from 2004 to 2005. After their split, he dated Dancing with the Stars judge Carrie Ann Inaba for two and half years and then actress Kara Tointon from 2010 to 2014. He then was in a relationship with Torrey DeVitto but the couple split on May 2017, after almost a year of dating. As of today, he is dating Total Bellas star, and WWE wrestler, Nikki Bella. The couple is enjoying their life happily without any disturbances. His sexual orientation is straight.